NOW (November 5, 2010) – Life around our house has changed dramatically over the past few years, but no more than it has in the past year. I’ll be catching you up little by little in the coming weeks so as not to take away from the true purpose of this blog – the recipes! For now, the first bit of big news is that we moved to the Upper Peninsula of Michigan just over a month ago. We’re now living in a tiny of town of just over 3,000 people on the shores of Lake Michigan. The closest stoplight is over 50 miles away. Our new home is 110 years old and we are beyond in love with ALL of it! I’m excited to get back to working on new recipes after an entirely too long break. In the meantime, I’ll be reposting some of our very favorite recipes with some new updates thrown in. And since this time of year is my favorite time to be in the kitchen, there are lots of recipes due for some updating! THEN (October 20, 2010) – Jill’s arrival threw off our fall schedule and our annual trip to the apple orchard had to get pushed back by a few weeks. Unfortunately, that meant that by the time we were ready to head out and tackle some apple picking as a family, the trees were bare. We made do with a trip to the orchard’s cider mill for a gallon of cider and 2 dozen donuts. We were also able to pick up a bag of already picked apples. Not bad for a consolation prize I suppose! As I unloaded some of those apples to display on our counter, I thought of these bars. I decided I needed to make them ASAP. I’m so glad I did just that because these are one of our favorite fall snacks. The bars are just bursting with juicy bites of apples and all the flavors of fall. They are moist and light with just the right amount of sweetness and spice. 1. Beat the butter with the sugars until creamy. Add the eggs and vanilla and beat until well combined. 2. In a separate bowl, combine the remaining ingredients, except the apples and walnuts. Stir well and add to the mixing bowl. Beat just until combined. 3. 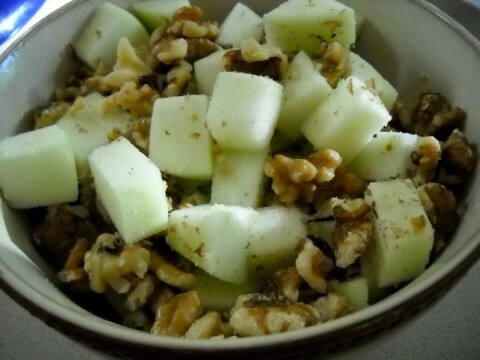 Combine the apples and walnuts and toss with the lemon juice. 4. 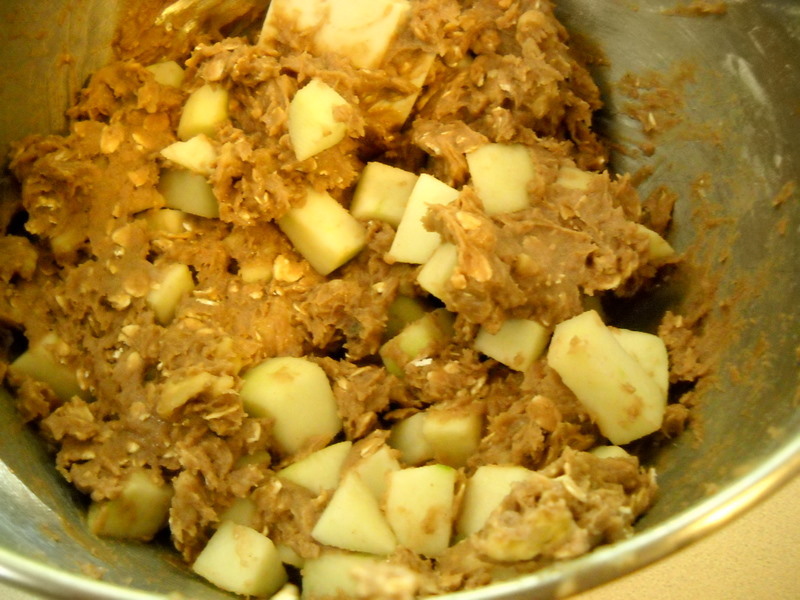 Fold the apple-walnut mixture into the mixing bowl. Spread into a greased 13×9 casserole dish. 5. Bake at 350 degrees for 20-25 minutes, until a toothpick inserted in the center comes out clean. Cool completely and cut into bars. Dust bars with powdered sugar, if desired. 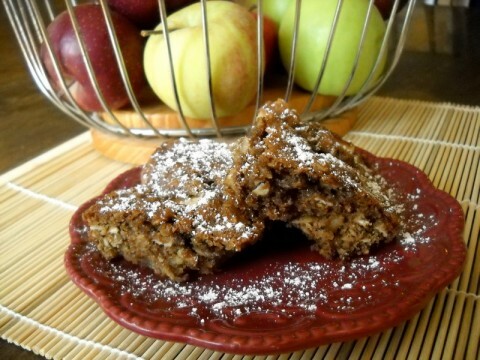 These bars also do double duty as a great dessert. Just warm for a few seconds in the microwave and top with some whipped cream or vanilla ice cream. Lightly drizzle on some caramel and enjoy! 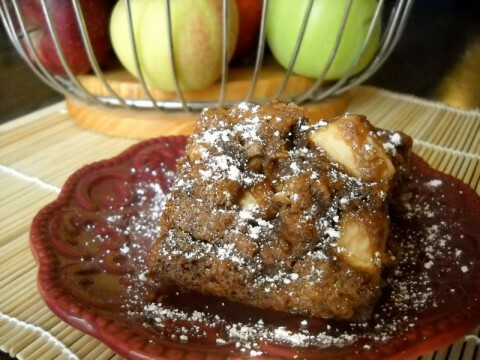 In a separate bowl, combine the remaining ingredients, except the apples and walnuts. Stir well and add to the mixing bowl. Beat just until combined. Fold the apple-walnut mixture into the mixing bowl. Spread into a greased 13×9 casserole dish. Bake at 350 degrees for 20-25 minutes, until a toothpick inserted in the center comes out clean. Cool completely and cut into bars. Dust bars with powdered sugar, if desired. What a great recipe. i have SO many apples and I need to figure out what to make. This is a good recipe.
.) Hello! I just would like to give a huge thumbs up for the great info you have here on this post. I will be coming back to your blog for more soon. Oh, I think these will be going into my oven (and tummy) shortly! Thanks for a great recipe!